CU CHI - Hunter-killer teams of Charlie Troop, 3d Squadron, 17th Air Cavalry combined with tactical air strikes to kill 17 Viet Cong in a day long action near Trang Bang. Gunships also destroyed enemy bunkers and rocket launchers. 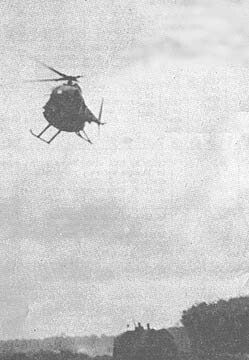 One team, composed of a light observation helicopter (LOH) and an AHl-G Huey Cobra gunship spotted one Viet Cong running across an open space four miles southwest of the city early in the morning. The LOH pilot, First Lieutenant Donald Fox of Chicago, Ill., aimed his mini-gun at him, pulled the trigger and it was all over. As Fox pulled up, he saw several freshly constructed bunkers. Then he spotted three 122mm rocket launchers hidden in the foliage by the Oriental River. Suddenly the LOH was receiving automatic weapons fire from three directions. He whipped the LOH off to one side away from the area and called the gunship in on the enemy positions. The Cobra pilot, First Lieutenant Dennis Marvicksin of Mineral Wells, Texas, put his ship into a steep dive and fired rockets at the position. He obliterated the rocket positions, five bunkers and killed another Viet Cong. As he called for tactical air strikes, Fox saw a third VC hiding in the water below. According to the squadron liaison officer W02 Thomas Mateson of McKeysport Penn., the gunship made another pass and the VC became "one very buoyant body floating down the river" as its rockets hit. "At the same time, we received a report from an ARVN forward air controller that he spotted 25 NVA dressed in camouflaged green uniforms walking across a rice paddy nearby," Mateson said. Cobra pilot Marvicksin, looking for the group, thought he saw some strange looking trees below. "Hey, trees don't walk," he was heard saying as he whipped the gunship around to attack. He killed four VC of the group of eight on the first pass. Fox and his LOH went in to survey the damage but couldn't find the other four VC, or any more of the reported 25. He did see one VC whom he literally herded down a road to an ARVN compound. He also counted almost 200 bunkers in the area. Lieutenant Fox called upon Forward Air Controller USAF Capt. Bradford Page of Jet, Oklahoma who directed tactical air strikes on the positions. Thirty five bunkers were destroyed. "At 3:15 pm, we received an intelligence report that a possible VC regiment had moved into the area near us," Liaison Officer Mateson related. Again Fox flew his LOH over the wet ground below. He spotted approximately 75 new bunkers and six anti-aircraft positions. He also saw one 122mm rocket and one 140mm rocket. A Cobra gunship piloted by W02 Robert Jones of Pittsburg, Pa., rolled in on his first pass pursuing a running man with a weapon. Mini-gun bullets cut the man down in his tracks and Jones rolled out of the pass. Looking down, he saw a 7.62mm Chicom machine gun which he blew apart on a return run. "Three tactical air strikes were called in and destroyed 30 bunkers," Mateson said. At 6:15 pm another hunter killer team arrived on station. "People began running everywhere after that strike," WOl John G. Taronosky Jr. of Philadelphia, Pa. related as he flew over in his LOH. As the sun set Cobra pilot Frank Marino of Turon, Arizona followed two running VC into some brush killing both with a fusillade from his mini-gun and destroying two of the anti-aircraft positions. Air Force air strikes destroyed the other four anti-aircraft positions. 1ST BDE - Following up an intelligence report of enemy activity in the Boi Loi Woods, the 4th Battalion (Mechanized), 23d Infantry Tomahawks, routed through a regimental-sized Viet Cong base camp. Company B, commanded by First Lieutenant Morgan Sincock of Natick, Mass., was sweeping on a reconnaissance-in-force mission on the northwest edge of the Boi Loi Woods when they received automatic weapons fire from both flanks. Immediately returning fire, the Tomahawks deployed in defensive positions. The battalion commander, Lieutenant Colonel Clifford C. Neilson of Mobile, Ala., was flying over the scene of battle in his command and control (C&C) helicopter and began directing maneuvers when he noticed a wounded U.S. soldier pinned down between Company B and the estimated reinforced VC company. The enemy also realized the precarious situation of the wounded man and tried to prevent anyone from coming to his aid. After three daring attempts, the wounded 1st Brigade soldier was extracted to a safe location for dust-off. The 1st Brigade infantrymen withdrew from the thick jungle and Neilson directed gunships from the 3d Squadron, 4th Cavalry, artillery from the 7th Battalion, 11th Artillery, and Air Force tactical air strikes on the enemy concealed in the dense foliage. While the area of contact was being hammered mercilessly, Charlie Company, commanded by Captain Henry Phillips of Columbus, Ga., maneuvered to link up with Bravo to form an arc around the enemy base camp. 1ST BDE - A combined force of 25th Infantry Division and ARVN soldiers brought to the surface a large cache of Viet Cong weapons buried six miles northwest of Saigon. Company D, 2d Battalion, 14th Infantry, came upon the goods while moving across a sugar cane field. "I was walking third when suddenly the ARVN in front of me stumbled, and his foot uncovered a Viet Cong poncho," said First Lieutenant D.J. Gillespie of Boyne Falls, Mich. The company halted and set up security while the ARVN soldiers dug with entrenching tools and uncovered 46 fuzed rounds of 60mm mortar, an RPG round and launcher, and 1,400 rounds of small arms ammunition. "The ARVN's made a significant contribution to our sweep and we're looking forward to working with them again," concluded Gillespie. 3D BDE - "They also serve." A few words from the familiar quote seem to describe the work that many people back home are doing to support the United States civic action program in Vietnam. Thanks to the efforts of the wife of a 3d Brigade officer, children in Dau Tieng have received American clothing, school supplies and candy. Mrs. Doris Fletcher, wife of First Lieutenant Alfred D. "Ranger Al" Fletcher, commander of Alpha Company, 3d Battalion, 22d Infantry, and her employer, Mr. James Anderson of Columbia, S.C., rounded up several bundles of the items and shipped them to the Regulars. When he received the supplies, Fletcher talked with Captain Wilmar Arroyo of the battalion civic action section and Captain Ira Mersack, the battalion surgeon. It was decided to distribute the bundles as part of a medical civic action project in the village. Fletcher was invited to go along and distribute the packages himself, so he could see first hand the type of work being done in the MEDCAP program. "I was very pleased to participate," Fletcher commented. "It made me feel I was really playing a part in the civic action program." On receiving the items, the children of the local Catholic elementary school showed an enthusiastic response. Perhaps it's true that "they also serve who only stand and wait," but they can do much more if, like Mrs. Fletcher, they try to help out while waiting for the war to be won. At least that's what the grateful smiles of village youngsters seemed to say. Be Sure To Show Party On Ballot! Some Armed Forces members lost their rights to vote in early Primary Elections this year because they did not indicate a political party preference on their Federal Post Card Applications for Absentee Ballot. This situation is arising, according to DOD voting assistance officials, because State voting officials must know what an absentee voter's party preference is before the proper absentee primary ballot can be mailed to him. Some 25 States will hold Primary Elections between 1 August and the 5 November General Election. In filling out absentee ballot applications for these primaries, servicemen should remember to indicate their political party preference. Prior to 1700, Tay Ninh was part of Cambodia and was known as Rodiemvary or "Garden of the Elephants." Most of the area was jungle and wasteland with only a small part of it being settled. Around the turn of the eighteenth century the area was annexed by Vietnam. There was no status as a separate administrative area until it became a part of Gia Dinh Province and was then designated as a "canton." In 1871, Tay Ninh was established as a province in its own right, with a full provincial administration and government. Infantrymen in Vietnam recently have begun using a tunnel exploration kit developed at the U.S. Army Natick Laboratories, Natick, Mass. The kit brings together the many items necessary for an unusual task that U.S. soldiers face every day in Vietnam: searching the maze of enemy underground hideouts. The complete tunnel kit provides equipment for three soldiers. It consists of four major sub-assemblies. The first, a weapons system composed of two .22 caliber automatic pistols and holsters, two bayonets and scabbards and four pairs of special silicone rubber and aluminum ear-plugs that protect the ears from sharp noises, but allow the hearing of voices and other normal sounds. The communications system includes a lightweight communications set with a head-set that has a microphone at the back of the head and a receiver over one ear, and a wire which is payed out from a cable dispenser attached to the back of the tunnel explorer's belt. Incoming sound can be cut off by a volume control that still allows the man in the tunnel to be heard outside. A lighting system includes two lightweight, waterproof lanterns that operate on six-volt dry batteries. Individual equipment including standard Army load-carrying items such as field packs, belts, suspenders and ammunition cases finish the kit. The beginning of this month the Army adopted a new promotion procedure for enlisted personnel. The standardization of procedures throughout the Army is the major advantage of the new system. Procedures varied from command to command in the past. Reassignment from one unit to another will no longer hamper a qualified soldier's opportunity for promotion. When a soldier on a promotion list is alerted for reassignment, his commander will notify DA that the individual is being carried on an approved recommended promotion list. Except for reassignments from a combat zone, a soldier will not normally depart his duty station until his assignment instructions have been either confirmed or changed by DA. The new procedure allows the individual to see how he stands in relation to others competing for promotion. The promotion scoring form will be used by his commander or representative when counseling him to point out areas in which the individual may need improvement to increase subsequent chances for advancement. Under the system, a total of 1,000 points is possible. It is divided into two parts, administrative points and a board interview. It is heavily weighted toward administrative qualifications and commander's appraisals which carry a total of 800 points. Administrative points cover seven areas including federal service, time in current grade, enlisted evaluation score, civilian education, military education, physical fitness and the enlisted efficiency report. Everyone is granted 70 points regardless of how many years on active duty he may have. Three points are then added for each six months period over the years of active duty required for the recommended pay grade. One-half point is subtracted for each six month period he is under the necessary amount of time. The enlisted evaluation score has a maximum of 150 points. Fifteen points are awarded for a score of at least 70 plus 45 points (100 minus 70 equals 30 and 30 times 1.5 points equals 45), making a total of 60. Individuals who fall within certain categories are awarded promotion points through a system of computation which does not actually include the enlisted evaluation system. This category includes personnel not evaluation system. Also personnel who have established a qualifying evaluation score in a recommended MOS, but whose MOS is changed or deleted by DA and lastly, those who are returning from an area where MOS evaluation and or promotion scores have been waived by DA. For these personnel, administrative point scores except on the enlisted evaluation system are added together, placed over 650 (the total points available without the evaluation score) and the resulting fraction multiplied by 800 (total points available counting all sections). Seventy five points total are awarded for meeting established educational requirements. For promotion to E-5, you must have completed 8th grade and E-6 and above, high school. Military education has a maximum of 100 points. Successful completion of an NCO Academy, command or other unit course of four weeks or longer is worth 30 points. Ten points are awarded for completion of a non-MOS course of more than two-weeks' duration up to a total of 40 points in this category. One point is granted for each credit gained in sub-courses up to a total of 30. The Board Interview is worth 200 total points. Twenty-five may be awarded for personal appearance, 25 for oral expression and versatility, 15 for knowledge of world affairs and the Army Information Program and up to 50 points for general military knowledge. Page 3 of this issue, which has not been included as part of this on-line reproduction, contains a list of state poll dates, offices open for nomination, qualifications for voting, voting registration dates and information on requesting absentee ballots and information on returning the ballots. 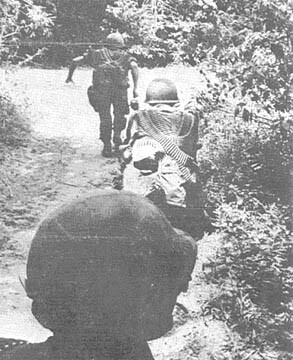 A long column of armored personnel carriers rumbles along the road north of Cu Chi as Charlie Company 2/22 secures the main supply route. For want of a message a battle was lost." So runs an old poem, which points up the fact that an army is only as effective as the supply system that supports it. Even the best of fighting men lose their field effectiveness without food, fuel and ammunition. The convoys must roll - and roll safely - to their destinations. The Viet Cong, well aware of the importance of supplies to the fighting potential of the United States Army, make every effort to harass and interdict convoys in order to disrupt and delay the movement of supplies. The job of blunting Charlie's efforts in the 25th Infantry Division's area of operations is the responsibility of the 2d Battalion (Mech), 22d Infantry. Every day the 3d Brigade unit carefully clears every inch of road from below Cu Chi north as far as Dau Tieng and Katum. Every night the Viet Cong skulk back to isolated portions of the roads to plant their mines and booby traps. Road security is an endless battle, a thankless and tedious job, punctuated occasionally by the blast of a mine or by a firefight. Long before first light the men of the Triple Deuce are up and preparing for the day's sweep. By the time the eastern sky starts to lighten, the riflemen have mounted their armored personnel carriers and are moving from night defensive positions to their sweep sectors. As soon as they reach their designated starting points, engineers dismount and assemble their minesweepers while dismounted flank and point security men are posted. When the engineers are ready, the sweep moves out. Slowly and carefully the road is swept. Every suspicious object is probed and examined; every bridge and culvert receives special attention. Whenever a mine or booby trap is found it must be either carefully deactivated or blown in place before the sweep team may proceed. 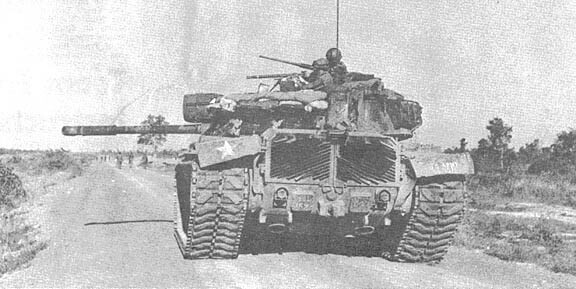 In addition to its own APCs and attached elements from the 65th Engineer Battalion, the 2/22 occasionally employs elements from other division units, such as mine-buster M-48 tanks from the 3d Squadron, 4th Cavalry. Artillery is always ready to render aid, while choppers of the 3d Squadron, 17th Air Cavalry scout the road in advance of the ground units. The Viet Cong do not sit idly by and allow the roads to be cleared with impunity. The sweep team must be always alert for the possibility of an attempted ambush, and be prepared to deal death on the enemy if he is rash enough to tangle with the Triple Deuce riflemen. As the sweep progresses, elements are dropped off at danger areas to watch the road and prevent Charlie from returning to sow his mines after the sweep passes. As soon as the several sweep teams link up, the word is flashed to Convoy Control: "Roll 'em." And north trucks roll, out of Long Binh into the 25th Division's area - the "Cu Chi Express," "Petro Main" and "Orient Express" roll over Vietnamese highways bringing the vital bullets and beans to the fighting men. The successful completion of the daily road sweep does not end the day's work for Triple Deuce riflemen, however. After the sweeps link up, the line companies go hunting for Charlie in the woods, rice paddies and rubber trees. And when these men find Charlie, they destroy him. Meanwhile, in the distance the dust kicked up by the rolling trucks signals that the men of the 2d of the 22d have done their work well. Working in cooperation with the ground sweep teams, helicopters of the 3d Squadron, 17th Air Cavalry aid in forward reconnaissance of supply routes. The early morning sun casts long shadows as dismounted infantrymen of Charlie Company Triple sweep the road to Trang Bang. 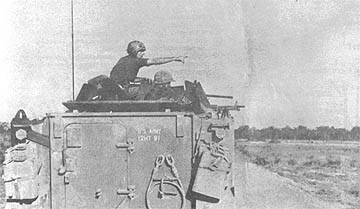 Sergeant Roger Baldwin of the Triple Deuce reconnaissance platoon points out a suspected enemy stronghold following a brief firefight with the enemy on the Dau Tien-Tay Ninh road. Positioned along the road to French Fort, an armored personnel carrier of Bravo Company Deuce, its .50 caliber at the ready, watches for signs of suspicious activity in the area. A mine-buster tank from Charlie Troop, 3d Squadron, 4th Cavalry, follows behind the Triple Deuce sweep team as the infantrymen clear the main supply route from Dau Tieng to Tay Ninh. 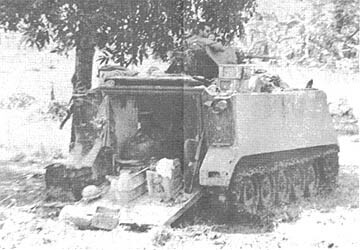 1st BDE - An armored caravan of hope ventured north of Nui Ba Den mountain to an isolated hamlet on the edge of War Zone C recently as the 1st Brigade began attempts to save a hamlet from the Viet Cong. The village of Bau Bac is one already divided. The population is half Vietnamese and half Chams (a people ethnically similar to the Montagnards). The two groups refused to work together and the situation brought both to the brink of starvation. Once before the people of Bau Bac had resided north of Tay Ninh's great mountain. 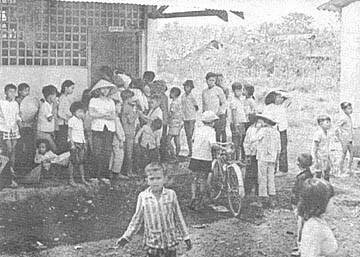 But with only one per cent of Tay Ninh Province's population living in War Zone C, the Viet Cong drove the people from their homes to refuge in Tay Ninh City. Colonel Trung, the province chief, gave the villagers permission to try again and return to their farms. 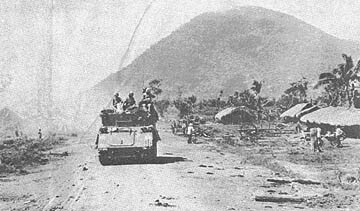 Five armored personnel carriers and a medical track from the 2d Brigade's 1st Battalion (Mechanized), 5th Infantry, escorted a truck laden with supplies past the slopes of Tay Ninh's Black Virgin mountain to the desolate hamlet. According to the 1st Brigade's S-5 officer, Major Arthur H. Seabrook of Charlestown, S.C., "We considered this hamlet touch and go. The area is one of heavy enemy infiltration, and we didn't know whether they were going to swing to the enemy or not." Supplies of rice, milk, apples, tin roofing and cement from the Brigade's civic action team were given to the village in an attempt to sustain them and instill a will to continue their fight for survival in their precarious location. Over 90 villagers were treated by the Bobcat battalion's MEDCAP team. Colonel Fremont Hodson, 1st Brigade commander, and Colonel Trung visited the hamlet to reassure the people of their concern for the hamlet's future. Seabrook met with the hamlet chief and made plans for the building of new homes and the construction of a road. "We're going to get out to these people at least once a week. I think we have a good start here and the future holds a lot of promise," concluded Seabrook. 3D BDE - "They may be mechanics, but they fight like infantrymen," said Captain Harvey R. Holter, commander of Company A, 2d Battalion (Mechanized), 22d Infantry. Since the first of the year, the company's mechanics have fought along side their line counterparts in every major engagement and countless small actions which have earned them the nickname of Keystone Cops. Included among the battles in which they have participated are the Battle of Soui Cut on New Year's Day, the Battle of Tay Ninh City, the large-scale action on Good Friday, and several encounters in the vicinity of Trang Bang. In addition, they pull the position and duties of a line track in night defensive perimeters. Virtually every man in the platoon led by Staff Sergeant Donald L. Maiberger of Lawton, Okla., has been decorated at least once for valor, while three have received Purple Hearts. In addition to fighting, the maintenance platoon has maintained the enviable record of 65 consecutive days without an armored personnel carrier of the company's being out of action longer than overnight for mechanical repairs. The men of the platoon rarely squawk about their duties, which often require them to stay up to the small hours of the night, only to arise early in the morning to accompany the company on its daily operations. CU CHI - A team of six officers and nineteen enlisted men from the 2d Battalion, 34th Armor, is teaching a refresher course in infantry tactics to selected units of the ARVN 25th Infantry Division. The purpose of the course is to mold the ARVN forces into a more effective fighting unit and teach the individual soldier the skills he needs to close with and destroy the enemy. Chief instructor of the team is Captain Robert O. Anderson of Weiser, Idaho. As are most of the team members, Anderson is a veteran of numerous combat operations with the U.S. 25th Infantry Division. Recently, the team completed the training of the ARVN 2d Battalion, 49th Infantry Regiment. The course, conducted at the 49th's base at Duc Lap, included such subjects as village cordon and search, night operations, use of supporting fires, and techniques of fire and maneuver. 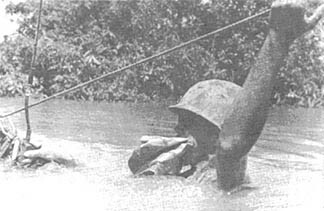 The ARVN soldiers were also taught patrolling techniques and were familiarized on several individual and crew-served weapons. Particular emphasis was placed on leadership techniques - especially as applicable to the small unit leader. CU CHI - While Tropic Lightning soldiers pursue the Viet Cong and North Vietnamese Army forces through the mucky rice paddies and thick jungles of Vietnam, teams of doctors and medics attack the problem of disease and sickness in nearby hamlets and villages. Armed with medicine, first aid kits and sanitary items, the Medical Civic Action Program (MEDCAP) teams have become familiar and welcome faces among the Vietnamese villagers. The objective of the MEDCAP program is to increase the health standards of the Vietnamese people while at the same time train the Vietnamese service personnel in modem methods of medical treatment. The scale of the MEDCAP program within the Division is quite extensive. In addition to the Division Support Command MEDCAP teams, each battalion normally has one team operating at all times. During the first six months of 1968, teams treated 149,818 villagers, averaging nearly 25,000 a month. The American teams, usually consisting of one officer physician and several enlisted technicians, try to conduct regular weekly visits to surrounding populated areas. Such visits are pre-planned with the approval of Military Assistance Command, Vietnam, and Vietnamese province leaders concerned. Often, due to varying tactical situations, irregular visits must be made. MEDCAP OFFICER listens attentively as Vietnamese women explain sickness of their friend. VILLAGERS GATHER quickly to be seen by the American MEDCAP team. MEDCAP MEMBERS carry supplies into village schoolhouse where they will administer medical treatment. VILLAGER DESCRIBES tooth pain to SP4 Ed Vondeveld as SP4 Charles Bollenbacher prepares to give immunization. MEDIC BANDAGES minor wounds of a Vietnamese boy. During their visits the MEDCAP teams avoid sophisticated medical care and treatment that the local government cannot maintain. The teams deal primarily with first aid treatment and immunizations. 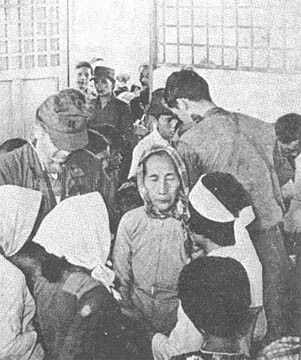 If, however, a patient requires more attention than the team can provide, he is removed to hospital facilities at the division base camp at Cu Chi for diagnosis and immediate treatment. If continued care is required, he is moved to the nearest Vietnamese provincial hospital. Division MEDCAP teams are doing much to bridge the gap between the American fighting man and the Vietnamese people. As one MEDCAP team member commented, "Our MEDCAP's have helped show the people that there is more to the American effort in Vietnam than stopping the enemy." assault from another flank and ran into two RPG nests. The fire fight raged into the night when the two Tomahawk companys withdrew to set up a defensive night location just 300 meters from the area of contact. The next day, the Tomahawks assembled on line and walked through the impregnable base camp with little resistance. "They certainly must have left here in quite a hurry because of all the equipment they left behind," pointed out Major Cain Bridgman of Chattanooga, Tenn., the battalion operations officer. There were field packs scattered all over and blood-stained bandages lying along blood trails. Bunkers with as much as five feet of overhead cover were checked out thoroughly. Company A, commanded by Captain Henry Montgomery of Memphis, Tenn., found a weapons cache in a bunker in the center of the huge base camp. The weapons were believed to belong to the enemy's heavy weapons section. PREPARING FOR THE ASSAULT - Taking cover behind an armored personnel carrier Private First Class Donald G. Stanfill of Detroit, Mich., softens up the enemy positions with his M-79 grenade launcher as Private First Class Charles Cooper (kneeling) of Paterson, N.J., prepares his M-16 for the assault. In the action the 4th Battalion (Mechanized), 23d Infantry, overran an enemy regimental-sized base camp. CU CHI - Would you believe two brothers in the same division? How about the same battery? What about two sets of brothers in the same battery? This is the case in Headquarters and Headquarters Battery, 25th Infantry Division Artillery. Specialist 4 James Layman, 24, works in the message center, and his brother, Private First Class Jerry Layman, 21, works in the motor pool. The two Layman brothers arrived in Vietnam one month apart. Specialist Layman volunteered for Vietnam while serving in Germany. Both turned down the Department of Defense regulation which provides that only one member of an immediate family need serve in a combat zone at one time. Specialist 4 Donald Parini and his brother, Private First Class Russell Parini, took basic training four weeks apart at Ft. Leonard Wood, Mo. Then Specialist Parini, 21, went on to Ft. Sill, Okla., and Private Parini, 20, was assigned to Ft. Knox, Ky., for further training. They met again in Vietnam in DIV ARTY. Specialist Parini arrived February 10, 1968. As with the Layman brothers, the Parini brothers close to pull their tours together in Vietnam. Specialist Parini is a cook in the battery while Private Parini is the driver for the DIV ARTY aviation officer. 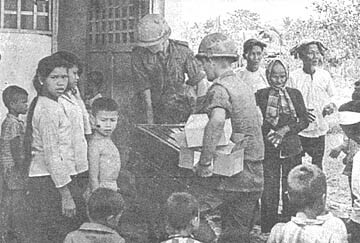 They are from Westmont, Ill.
3D BDE - A people-to-people medical program for the South Vietnamese has been launched by one conscientious American citizen. Signe (Mrs. Frank) Moon of Bellevue, Wash., first cousin of the 2d Battalion (Mech), 22d Infantry commander, Lieutenant Colonel King J. Coffman of La Crescenta, Calif., sends shipments of medical supplies and sundries to the Triple Deuce nearly every Monday to aid the Battalion in conducting Medical Civic Action Projects (MEDCAPS). Included among the items sent by Mrs. Moon are surgical soap, bandaids, and various ointments. 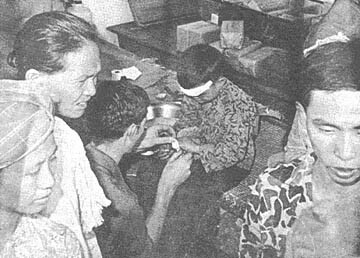 She also sends small toys and sampler packets of perfume which were passed out during MEDCAPS as favors to the South Vietnamese women and children. Mrs. Moon, in addition to being the mother of two lively youngsters, is a registered pharmacist and hence has ready access to the items she so generously is providing. Even the neighbors have been caught up in her enthusiasm and ask her how they may help. The materials were gratefully received by 1st Lieutenant Albert Vogel on behalf of the Battalion's Medical Platoon and 1st Lieutenant Ken Templeman, the Battalion Civil Affairs Officer. 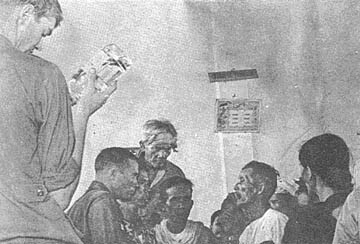 The Battalion's MEDCAP Team is presently conducting their programs several times weekly in the vicinity of Tay Ninh city, northwest of Saigon near the Cambodian border. Mrs. Moon is presently interested in finding a Vietnamese orphanage for the Council of Bluebirds in her area to sponsor. The Civil Affairs section is at work on the project for her now. As Mrs. Moon said, she "wants the Vietnamese to know someone cares." CU CHI - The time and place were different, but the unit was the same as Staff Sergeant Gene Franks of Selah, Wash., took the oath of reenlistment from Lieutenant Colonel Clemens A. Riley, commander of the 3d Squadron, 4th Cavalry. In 1965, Franks signed for a three year hitch while serving with the 25th Infantry Division's Cav unit at Schofield Barracks in Hawaii. After completing tours with two other units in the States and Europe, Franks returned to the 3/4 Cav in May, 1968, and was assigned to the same section, same troop. Almost three years to the day after taking his first oath with the 4th Cavalry squadron, Franks took his second oath, this time in Cu Chi, Vietnam. He has served with all three squadrons of the 4th Cavalry Regiment. Of them all, Franks says, "I'd rather be in the Three-Quarter; it's more like home to me."